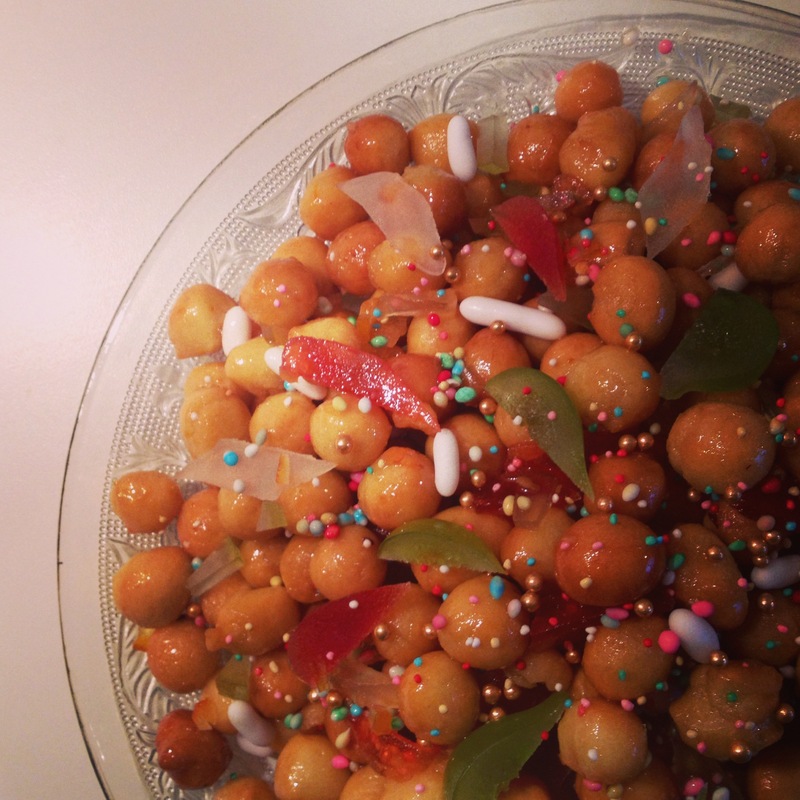 Struffoli is one of the essential Christmas dishes in our home. This Neapolitan dessert, not dissimilar to Greek / Turkish Lokma where deep-fried dough is immersed in syrup, shows the influences which became the city. Jeweled with candied fruits and sugar covered Fennel seeds and Cinnamon shards, Struffoli bears an incredible resemblance to the national dessert of Tatarstan called Çäkçäk . I like to think there is some connection between Napoli and the Central Asian country, a connection which stretches way beyond the Mediterranean Sea. 1 tbsp rum OR 1 & a half tsp ground anise. Mix sifted flour, sugar, bicarb & ground anise together in a bowl. Add butter and mix through with fingertips. In a separate bowl beat eggs together with zest and rum (if not using anise). Pour into flour mixture and work together with hands until you have a dough. Turn out onto a floured surface and knead until dough begins to feel smooth and elastic then wrap in cling film and let rest in fridge for at least an hour. Divide dough into quarters. Roll each into long thin strips, about 1cm wide. Cut into squares and roll each into balls, roughly the size of hazelnuts. Dust with flour to keep from sticking together. Fry in sunflower oil, turning with a slotted spoon until golden then set aside on kitchen paper to cool and drain. In another pan heat honey, sugar and water together for 10 minutes, take off heat then squeeze in the juice of lemon. Add the dough balls, turning to ensure a good coating on each piece then your candied fruit. Mix thoroughly then add hundreds and thousands / sugar coated seeds stirring through only a couple of times, (any more and colouring will disappear!) reserving some for decoration. Arrange on a serving dish and decorate top with slithers of candied fruit and candies. Leave to cool completely and set before serving.